Welcome to VLI Events redesigned site! Our primary goal with this sleek remodel is to better serve our clients. We hope the services we provide are more accessible and the type of events we have helped throw are made clear. Instilling confidence in our clients is an important step we take seriously. Whether you are an event coordinator, party planner, or overwhelmed mother-of-the-bride VLI Events is here to help! No matter your events size. 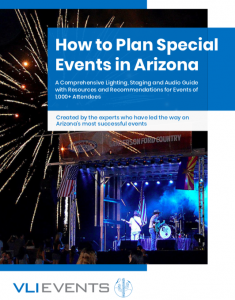 Download our Guide to Planning Special Events in Arizona for inspiration and instruction from our event experts then reach out to schedule a complimentary event consultation. Get news, specials & more! Get a copy of our Go To Event Planning Guide to host a killer event!